It all began with one misspoken confession. Chiyo finally gets up the nerve to confess her feelings of love to Nozaki-kun, a boy at her school. When the time comes she intends to say “I have always loved you”, but instead blurts out “I have always been your fan”. The moment is ruined. There is no way she can recover from such an embarrassing situation. Unbeknownst to Chiyo, Nozaki is the author of a manga. Being somewhat accustomed to people saying they are his fan he simply nods and gives her his autograph. Chiyo decides not to give up. She won’t let this get her down so she works up her courage and tries again. This time stating “I always want to be with you”. To her delight he invites her over to his apartment – to have her help him with his manga drawing. This isn’t the romantic evening she was hoping for. This does however lead her to the realization that he is in fact a manga author. And not just any manga author, he is a renowned author of shōjo manga (for teenage girls). Through the continued school term she meets some of his other friends that often come over to help with his manga, as well as the people in her own school that he has based his manga on – and it isn’t what she thought. This was a hysterical show that had me laughing out loud many times. I certainly hope it gets licensed for an English dub because I think some of the humor is lost having to read it instead of watching the expressions of the characters. While this was a “high school” anime, the focus of the show is not their life in high school. 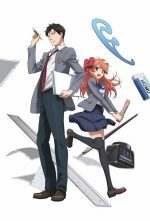 Rather the focus is on Nozaki’s desire to become a better author as well as learning how he translates what happens to his close friends in school into his manga – without their even knowing it most of the time. Various characters get introduced as the show progresses which gives a refreshing feeling. Instead of always focusing on just Chiyo’s repeated attempts to get closer to Nozaki we meet new characters and learn about their own personalities. Additionally, each character has issues of their own. Often these issues, and the messes they get themselves into, are things that I can relate to people I know.